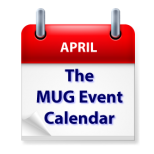 This week’s MUG Event Calendar features an appearance by Dave Hamilton of The Mac Observer at a Pennsylvania group, and a review of Personal Finance software at a California group. Siri will be the topic of discussion at a group in Hawaii, and a Texas group will focus on iPhone photography. Some of the other topics on this week’s agenda include iCloud, Excel, tvOS, and the digital shoebox.